Philip Craven, the president of the International Paralympics Committee, talks about how to make the Paralympic Games more attractive to spectators and help people with disabilities. 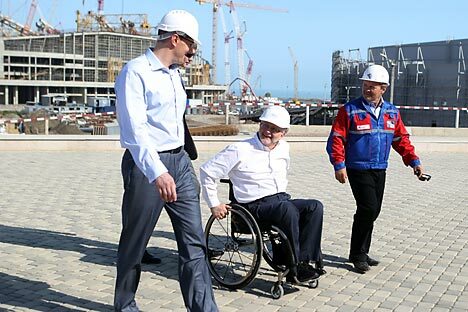 With the Sochi Paralympic Games scheduled to start immediately following the Winter Olympic Games, the president of the International Paralympic Committee says preparations for the event are going as planned and should be one of the best in the history of the games. Rossiyskaya Gazeta: What changes have occurred in Paralympic sports since your election as president of the international Paralympics’ Committee (IPC) in 2001? Philip Craven: During this time the Paralympics movement has grown considerably. For example, right now the Paralympic Games are the third largest sporting event in the world in terms of the number of sold tickets and television audience reach. Athletes also became more recognizable, and in many countries they have become heroes. But the biggest progress in the IPC is in the organization of people with disabilities to become a global sports organization. More and more people see that the Paralympic Games are a sport of high achievements, where the best athletes in the world compete. RG: Are you planning to incorporate new disciplines in the Winter Paralympic Games? P.C. : In the coming years, we must increase the scale of these games through the inclusion of new sports. It is for this reason that for the first time skiing competitions on Para-snowboards will take place in Sochi. Today, the Paralympic summer games include 22 types of sports, in which 4,300 athletes take part. In comparison, the winter games have five sports and 750 athletes. We want to reduce this gap. Already in the year 2018 in Phenčhane para-snowboard will become an independent sport, so the number of sports will increase to six. RG: In the world, as it is in Russia, the interest in the Olympics is higher than that of Paralympics. What should be done to change this attitude? P.C. :First of all, we should not forget that the first Paralympic Games were held in 1960 and the first Winter Paralympic Games 16 years later. The Vancouver games were very successful, but we need to make the games in Sochi even better. The Paralympic Games in London were the best in history, but in Rio 2016 we must become even better. It is important to keep the interest of fans between games. RG: What about the translation of the Paralympic Winter Games in Sochi? P.C. :It is expected that the Sochi Games will be broadcasted more than the previous games. More than 1.6 billion viewers watched the Paralympic Games in Vancouver 2010. As for Sochi, we have a deal with local broadcasters to increase the number of hours of broadcasts. A major breakthrough occurred in the United States, where NBC and NBC Sports will provide more than 66 hours of coverage, which is much more than before. RG: Are you satisfied with the ongoing preparations for the Paralympic Games in Sochi? P.C. :If we talk about the preparedness of the sports facilities and infrastructure in Sochi, I believe that the organizers are to be congratulated with the work that has been done to create a barrier-free environment in the city. However, this work should not be restricted to where the competitions are to be carried out. In the future I would like to see how the infrastructure gets its development throughout Russia. This should be one of the elements of the games legacy. You also need to focus on the sale of tickets for Paralympic competitions. Russians should not miss this event. You cannot miss the opportunity to cheer on visually impaired skiers, who come down from the mountain at a speed of 100 kmh, or experience the explosive energy of ice sledge hockey. RG: Russia will soon be taken over by the Paralympic flame relay. What role will it play in drawing attention to the Paralympic Games and Paralympic sport? RG: What, in your opinion, will be the most important for the legacy of the Paralympic Games in Sochi 2014? P.C. :The most important thing is the change in attitudes of the Russian society towards people with disabilities. It is also important that people with disabilities are increasingly involved in public life –in work and in sport. Previous games have shown that sports achievements of Paralympic athletes can help.